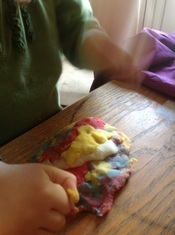 Play dough is brilliant. Practically free and endless possibilities. Plus it lets kids do the whole messy play thing without actually making that much mess, which is always a good thing.Plus if you use the cheap home made version you don’t need to worry about mixing the colours. I start off with a variety of basic colours (usually based on whatever colourings I have to hand) and then let the kids make further colours by mixing. You can also just add boiling water to the ingredients in a bowl and stir, to avoid having to put it on the hob. I tend to leave out the colourings and flavourings, cook plain dough and then knead in the colours/flavours/glitter. That way I only have to cook once but can make loads of colours. Beware though that colourings can stain, and are much more likely to stain your worktop (and hands, and clothes, and children) before they are mixed in. This recipe isn’t toxic, but isn’t exactly edible either, given that it will taste horrible and has loads of salt. Hopefully inquisitive toddlers will just have one taste and then be put off. Hopefully. Keep your playdough in an air tight container and it should last at least six weeks. Enjoy, and let me know if you come up with any cool ideas! « SkyFall – Does “M” stand for Mother?